Every project ends, eventually. 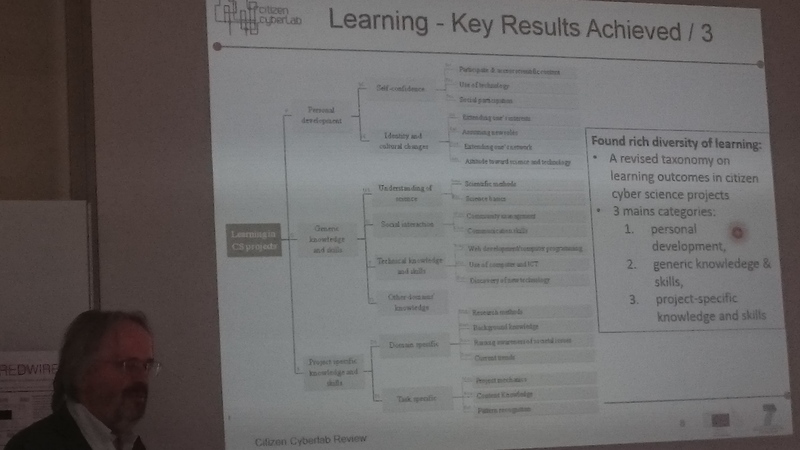 The Citizen Cyberlab project was funded through the seventh framework programme of the European Union (or EU FP7 in short), and run from September 2012 to November 2015. Today marks the final review of the project in with all the project’s partners presenting the work that they’ve done during the project. The project had a technical elements throughout its work, with platforms (technologies that provide foundation to citizen science projects), tools (technologies that support projects directly by being part of what volunteers use), and pilots – projects that use the technologies from citizen cyberlab as well as from other sources, to carry out citizen science projects. In addition to the platforms, tools or pilots – the project used all these elements as the background for a detailed understanding of creativity and learning in citizen cyberscience, which rely on Information and Communication Technologies (ICT). So the evaluation of the pilots and technologies was aimed to illuminate this question. This post summarises some of the major points from the project. The project produced a system to develop and share research ideas (ideaweave.io), a framework for scientific games (RedWire.io) which is accompanied with tools to measure and observe the actions of gamers (RedMetrics.io), systems for sharing computation resources through virtual machines (through CitizenGrid platform), and a framework to track user actions across systems (CCLTracker), a platform for community mapping (GeoKey), mobile data collection tools (EpiCollect+). Some of the systems that used these platforms and tools include Mapping for Change Community Maps, CERN Virtual Atom Smasher, and UNITAR Geotag-X. The RedWire platform supports the development of games and the mixing of code between project (borrowing concepts from synthetic biology to computing! ), and as the system encourages open science, even data from the different games can be mixed to create new ones. The integration with player behaviour tracking ability is significant in the use of games for research (so that’s done with RedMatrics). The analytics data is open, so there is a need to take care of privacy issues. An example of the gaming platform is Hero.Coli – a game about synthetic biology. The GeoKey platform that was developed at UCL ExCiteS is now integrated with Community Maps, ArcGIS Online and can receive data trough Sapelli, EpiCollect or other HTML5 apps (as the air quality app on Google Play shows). The system is progressing and includes an installation package that make it easier to deploy. Within a year, there are about 650 users on the system, and further anonymous contributions, and over 60 mini-sites, many of them ported from the old system. The system is already translated to Polish and Spanish. The Citizen Grid is a platform that improve volunteer computing, and allow the access to resources in a simplified manner, with launching of virtual machines through a single link. It can use shared resources from volunteers, or cloud computing. The IdeaWeave system, which is a social network to support the development of ideas and projects, and share information about these projects. The final system supports challenges, badges and awards. They also add project blogging and ability for voting on proposals. 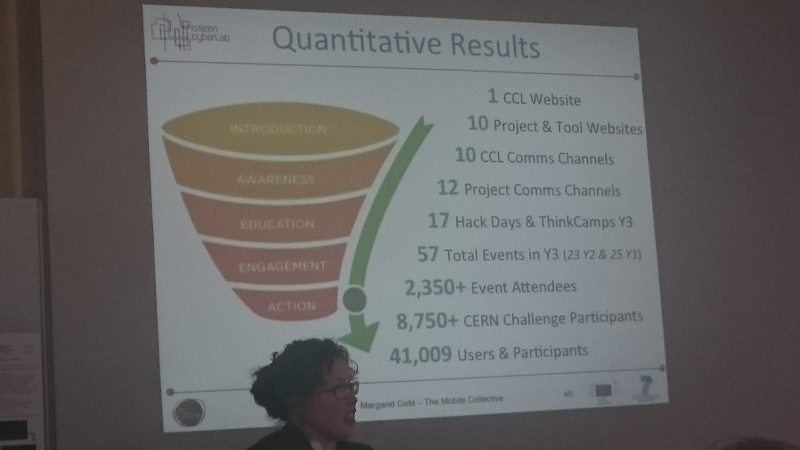 The Virtual Atom Smasher application in CERN was redesign with the use of learning analytics, which shown that many people who start engaging with it don’t go through the learning elements and then find the interface confusing, so the restructuring was geared towards this early learning process. The process help people to understand theoretical and experimental physics principles. The system, which test4theory.cern.ch . After participants log in, they go through a questionnaire to understand what the participant know, and then go through video and interactive elements that help them to understand the terminology that is needed to use the interface effectively, and the rest of the process supports asking questions in forums, finding further information through links and more. Some of the side projects that were developed from Virtual Atom Smasher include to TooTR framework that supports creating tutorials that are web-based and include videos and interactive parts. During the project, they have attracted 790 registered participants, 43 spent more than 12 hours with the game. Now the game is gaining attention from more scientists who are now seeing that it is worth while to engage with citizen science. 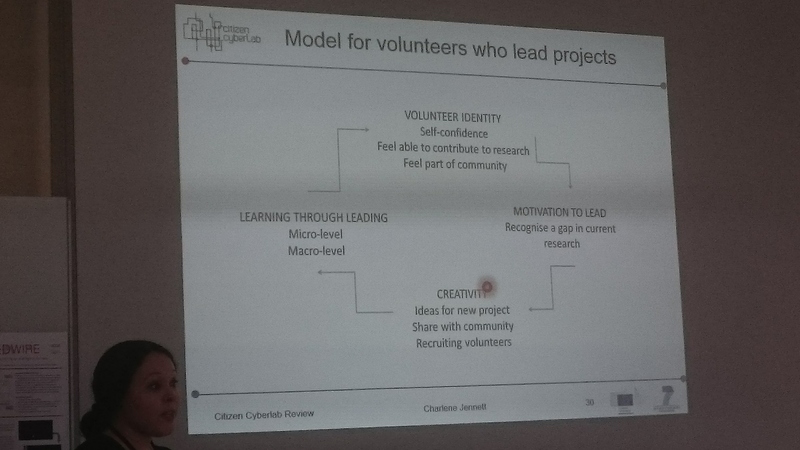 The project is fusing volunteer computing and volunteer thinking. GeoTag-X provides a demonstrator for volunteer thinking, and was developed by UNITAR. It allow the capturing of relevant imagery and pictures from disaster or conflict situations. It support UNITAR humanitarian operations. They wanted to assess if the system is useful. They have 549 registered volunteers, with 362 completing at least one task. GeoTag-X engaged with the humanitarian Geo community – for example with GISCorps, UN Volunteers Online, and Humanity Road. The Synthetic Biology pilot included the development of MOOC that explains the principles of the area, the game Hero.coli, developed a new spectrometer that will be produced at very large scale in India. Our own extreme citizen science pilots focused on projects that use cyberlab technology, so focusing on air quality monitoring in which we used GeoKey and EpiCollect to record the location of diffusion tubes and the street context in which it was installed. In addition, we included the use of public lab technology for studying the environment, and playshops to explore the exposure to science. The research into learning and creativity, shown that there is plenty of learning of the ‘on topic’ and the mechanics of the citizen science, with small minority showing deep engagement with active learning. There is variety of learning – personal development – from self-confidence to identity and cultural change; generic knowledge and skills; and finally project specific aspects. The project provides a whole set of methods for exploring citizen science: checklists that can be used to help designing for citizen science learning, surveys, interviews, analysing blogs, user analytics, and lab studies. Some of the interesting finding include: in GeoTag-X, even a complex interface was learnt quite quickly, and connecting emotionally to the issue of humanitarian issue and participation can predict learning. The Virtual Atom Smasher demonstrated that participants learned about the work of scientists and science (e.g. the plenty use of statistics). In SynBio4All, there was plenty of organisational skills, lab work, scientific communication and deeper contact with science – all through need to involved in a more significant way. The ExCiteS pilots show involvement and emotional learning, and evidence for community ‘hands on’ situated learning with high engagement of participants. There are examples for personal development, scientific literacy and community organisation, hosting workshop and other skills. One of the major achievement of this study is a general survey, which had 925 complete responses and 2500 partial ones – from volunteers across citizen science (80 projects) – clusters show 25% learn about technology and science skills, 21% learn about the topic and scientific skills, about 20% learn about science skills, but some collaboration and communication, 13% pure on-topic learning. In citizen science, high percentage learn from project documentation, next about 20% learns through the project and some from documentation, about 17% learn from the project and external documentation, next there was a group learning through discussion. Most feel that they learn (86%). learning is not initial motivation, but become an important factors, and also learning about new area of science. Highly engaged volunteers take on specific and various roles – translators, community managers, event organisers etc. On the creativity side, interviews provided the richest source of information on creativity and how it is integrated into citizen science. Interviews with 96 volunteers provided one of the biggest qualitative survey in citizen science. Motivations – curiosity, interest in science and desire to contribute to research. They sustained participation due to continued interest, ability, time. The reasons for different audience composition are task time, geography and subject matter. In a lab study, it was shown that citizen cyberscience results are related to immersion in the game. There is also evidence that people are multi-tasking – they have plenty of distractions to the engagement in any given online project. The key finding about creativity include examples in the analysis of the images and geotagging in GeoTag-X. in the Virtual Atom Smasher, adjusting parameters seen as creative, while in SynBio4all the creation of games, or the creation of the MOOC were examples of creativity. In ExCiteS there are photos, drawing, sculptures , blog posts With air quality we’ve seen examples of newsletter, t-shirts, or creating maps. There are routes through the Motivations, learning and creativity. Might need to look at models for people who lead projects. To support creativity face-to-face collaboration is important, allow entry level of volunteers, and provide multiple methods for volunteers to provide feedback. In terms of engagement – we carried out ThinkCamp events, linking to existing online communities, working through engagement and participation. Interestingly, analysis of twitter shown following from fellow researchers and practitioners in citizen science. The citizen cyberlab will now continue as an activity of the university of Geneva – so watch this space!